Wellbeing is a state of being happy and healthy in our bodies (physically) and in our minds (mentally). As business leaders we must consider wellbeing at work and our duty of care to employees. We must also recognise that common mental health conditions (which may not have been directly caused by work), could be considered a disability under the Equalities Act 2010 and therefore have legal protection. 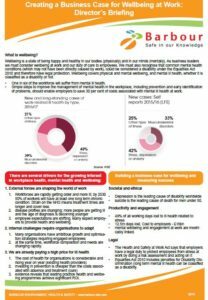 Wellbeing covers physical and mental wellbeing, and mental ill health, whether it is classified as a disability or not. Why implement a wellbeing programme? What does mental ill health at work really cost?